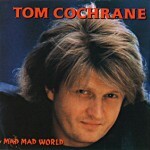 This week’s instalment of Music Monday is Tom Cochrane‘s 1991 hit, Life Is a Highway, from his second album Mad, Mad World. A good friend recently introduced me to Chris LeDoux, a really excellent country music artist who’d been around for a long while, but of whom I’d never heard. His cover version is from his 1998 album, One Road Man. This entry was posted in Music Monday, People and tagged Chris LeDoux, covers, music, Tom Cochrane, video.